Discoverour New LOVE MY PLANET eco camps to learn how to make small positive changes in your world to reduce your ecological footprint with FUN, ENGAGING, and HANDS-ON activities. Experiential learning at its best! Develop a Curious child with Critical thinking skills to better evaluate situation and problems. Develop skills to gather pertinent Information prior to coming to a conclusion or form a judgement. Develop a habit of Awareness: taking a moment to examine our action, our thoughts and our behavior and how these impact on our world. Planet Protector: focus on discussing the impact of humans on the land and how we can help with a special interest on impact of agriculture and food waste. 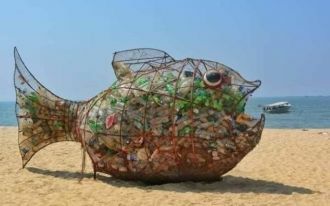 The Plastic Invasion: focus on learning about the impact of plastic and how we can reduce our dependence on it. Upcycling: focus on learning to create new useful items with old unused ones. The ultimate re-use and re-purpose camp! Find more informations about our Eco Camp here. The program fee is $325 per week (plus HST). More details about our fees, discounts and FAQ on the pricing camp page. Let your child understand the impact of their footprint!